“NASA’s Chandra X-ray Observatory has discovered an extraordinary outburst by a black hole in the spiral galaxy M83, located about 15 million light years from Earth. Using Chandra, astronomers found a new ultraluminous X-ray source (ULX), objects that give off more X-rays than most ‘normal’ binary systems in which a companion star is in orbit around a neutron star or black hole. On the left is an optical image of M83 from the Very Large Telescope in Chile, operated by the European Southern Observatory. 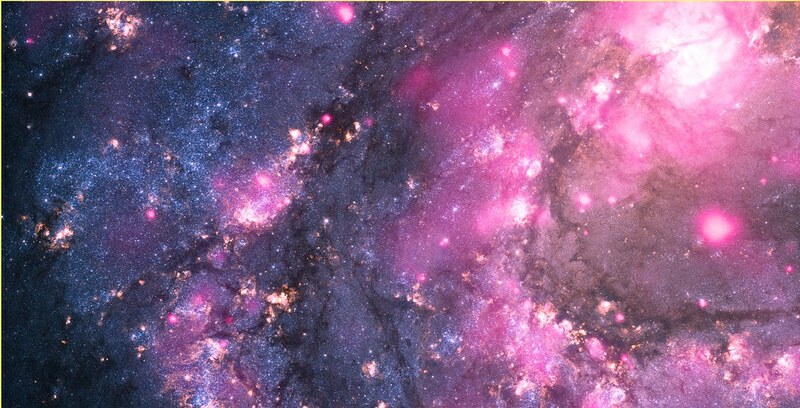 On the right is a composite image showing X-ray data from Chandra in pink and optical data from the Hubble Space Telescope in blue and yellow. The ULX is located near the bottom of the composite image. Optical images reveal a bright blue source at the position of the ULX during the X-ray outburst. Before the outburst the blue source is not seen. These results imply that the companion to the black hole in M83 is a red giant star, more than about 500 million years old, with a mass less than about four times the Sun’s. According to theoretical models for the evolution of stars, the black hole should be almost as old as its companion. Evidence was also found that the black hole in this system may have formed from a star surprisingly rich in ‘metals’, as astronomers call elements heavier than helium. The ULX is located in a region that is known, from previous observations, to be rich with metals. Posted in Big Picture, Photography | tagged astronomy, black hole, deep space, galaxies, NASA, pink, science, space, stars. The permalink.